This fox has been watching me work for quite some time now, I’ve enjoyed having it in the burrow. 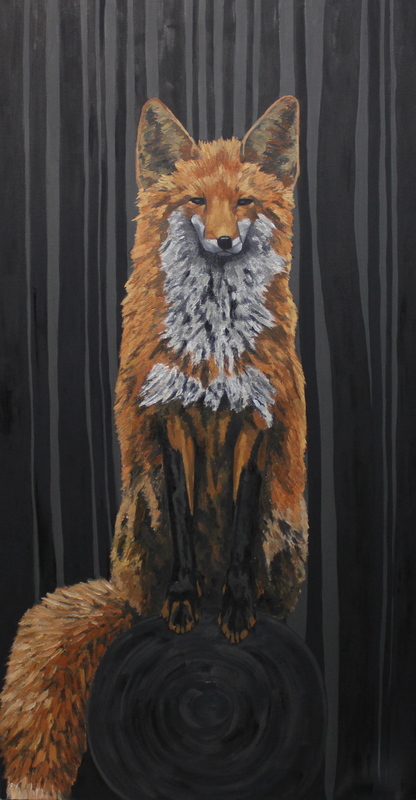 For all the time I spend painting in the abstract realm, with the grids and all, I enjoy the change of pace and dedicating certain days to painting representational stuff, like this Fox here. It’s interesting how things happen though, I wanted to paint a fox after reading Omensetter’s Luck, by William Gass, which is a beautiful novel. There is an interesting section in the book where a fox falls down a well. I was struck by the image, and while reading the book I started doing drawings of a fox down a well, from the perspective of the top of the well, looking down the circular tunnel at the fox in partial light. I never did much with the well drawings, and became more interested in the fox in general, apart from the well and the particular instance in the novel. I decide to paint this one of the fox sitting on top of a chopped down tree, I liked the posture of the fox, and the way it sat on the circle, it seems to be a bit mystical and the tree stump was a bit suggestive of the well, overall I thought it’d make a good painting. I begin working on the Fox while I’ve got Deep Sea in the studio. Shortly after beginning the fox, I complete Deep Sea, and stretch a canvas for In Utero and set it up on the wall opposite the Fox. While working on the Fox, I’m not sure what to do with the background, so I begin experimenting, I do drips of turpentine on a coat of oil, and I discover this viney, mossy, veiny sort of effect that occurs when you use enough turpentine. Although this ended up being covered up in the fox painting, it’s the exact same technique I used on an early layer of In Utero. By this point I’ve forgotten about the well, but this Fox and the way it sits in the studio seems to be this presence, like it watches, or even aids. What is interesting is how, when you immerse yourself in a medium and spend enough time with it, day after day, things just start to happen. Engaging with art is very much like religious faith in the sense that, things happening in a medium after practice and dedication can be compared to the way someone who prays every day will then have a “sign from god”, or something to that effect. The idea here is a universal that demands a particular, to rephrase the concept; the emergence of a moment of intensity arises only after a duration, but the “break” or “sign” is only significant to the single subject, and occurs in the way that the single subject uses her/his attention. The new understanding of a medium is unique to the painter, just as an occurrence becoming divine is unique to the religiously faithful. The uniting principle, is that there is no way to predict when these moments happen, but that the practicing person will receive them. So anyway, working on the fox ends up giving me what I need to create In Utero. I finish In Utero, and it’s sitting in the studio drying, and on the opposite wall, facing In Utero, is the fox. And so I’m sitting in the studio one day and all of a sudden it hits me, I get goosebumps, and see that this whole time, the Fox has been looking at the circle, as though it were down a well. By the circle, I mean the massive circle composition of In Utero, directly across from the fox. And then I think, before it was looking at the circle, it was looking at the water of Deep Sea, and suddenly it was all there, the fox fell down the well into the water, and then looked up at the circle of light. It all seemed just a bit uncanny to me at the time. Even though I abandoned the idea of painting a fox down a well, there was an alignment of thematic substance from a more abstract perspective. Funny how things happen sometimes I suppose.